She’s a real beauty, I’m sure you all agree. Of course I’m talking about our new arrival, little Montana, whose lovely looks and cheeky personality have already earned her a massive fan club. I kept you all in touch with events on the night of her birth via our Facebook page and it attracted such huge interest that I thought I would share with you all my foal diary. I always like to keep a diary when one of my mares is in foal so I can keep a record of all the changes as the weeks go by. Then I can be there to make sure that both mum and baby are absolutely safe throughout the labour and birth. Larosa – Lola to all her friends – is our lovely bay Welsh Section D mare. She was in foal to our coloured stallion Zidane, a first pregnancy for her, and the baby was due on May 20th. 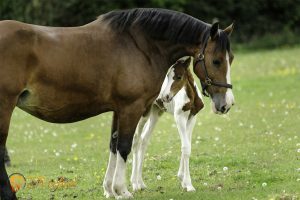 She was scanned in foal in July 2014 and continued to work up to December when she started her maternity leave. On March 10th she moved into her foaling box and we began camera monitoring on April 27th. April 28th: For a maiden mare Lola has a huge baby bump and has already changed shape behind. April 29th: Lola is quiet in the field during the day but has started to become restless in the stable at night. May 3rd: Lola has started kicking out at her belly and rubbing her tail, but has not really developed an udder yet. May 4th: Standing quietly but scratching her back legs together and flashing her tail frequently – I think the baby’s kicking! May 5th: Shaking her head and biting her stomach tonight. May 6th: She’s doing what I call mooching in her bed – making a nest. May 9th: Rubbing her tail and pushing against the stable – I find mares do this when their foals are active. Lola’s udder is developing and she has a tiny bit of wax on her teats. She is becoming very restless and walking her stable and stamping a lot, signs that she is becoming increasingly uncomfortable. May 10th: This morning Lola didn’t want to go out in the field – unlike her! But we turned her out as I find it relaxes the mare. She’s in the field next to Zidane which seems to settle both of them. We’ve seen her rolling more than normal in the paddock. May 11th: I’ve spent the last couple of nights watching her closely as maiden mares can be sneaky and she’s showing me all the signs of labour! I’ve now plaited and bandaged her tail and left the stable light on. May 12th: This morning Lola is still reluctant to go out to the field and her udder is very full. May 12th – 5pm: She has now completely waxed up on her teats and is dripping milk. Foaling should happen tonight! 7.30pm: The baby is either kicking or very big – contractions are happening! 8.45pm: She’s digging her bed (nesting)! Her back end spasms underneath her four times. 8.53pm: Mooching her bed and digging again. 9.41pm: I can see on the monitor that the white bag is visible. This is now when I can go in to her, never before as you can interfere with the birth. I’ve learned that in the past! Once the bag is visible it’s the point of no return for the mare, the baby is coming. 10.03pm: I can see two legs and a little nose but she seems like a big foal so I give Lola a little help and our new baby is safely delivered. 10.30pm: She’s standing for the first time, a very strong little girl. As we always expected, Lola is proving to be the ideal mother. Zidane has had a good look at his new daughter and is very proud. Mare and foal are now out in the field in the daytime, enjoying the sunshine, and Montana is loving testing out her long legs. We had lots of suggestions for names, following our Chase Stud theme of American states. I eventually had a shortlist of five and finally went for Montana. It seems to suit her perfectly and fits very well with her brothers and sisters, Dakota, Oregon, Indiana and Arizona. I’m sure you all wish her a warm and loving welcome to the trekking centre. 23.20: She’s feeding from mom. Buying a new horse can be a minefield, especially for the inexperienced. I must have looked at hundreds of horses for sale since I set up the trekking centre here on Cannock Chase and over the years I have developed my own checklist that I go through when I’m viewing a potential new candidate. When I need to find a new recruit I listen to recommendations from people I know and I study horses for sale adverts on the internet. Then I go to view. 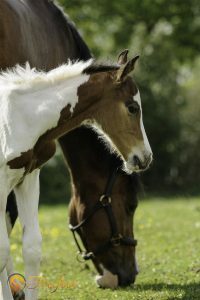 I like a particular type of horse for the centre, but the basics are the same even if you are buying a little pony for your children. I always get them trotted up so I can see their action and check that they are straight behind. Check the legs for lumps and bumps and pick the feet up. Always find out the horse’s history and have a look inside the mouth to check age. Also ask to see the passport and any other paperwork and make sure that everything matches up. Temperament is vitally important. If you are a beginner or a happy hacker you really don’t want something feisty and fiery! If you can only ride at weekends, don’t buy something that needs schooling every day. You will soon find you have a problem on your hands. I ask the owner to tack them up in front of me. I like to see them being tacked up – or even ask if I can do it myself – and I normally ask the owner to ride the horse for me. I always insist the owner gets on first – if it’s going to buck they can be the one who hits the ground! Always find out what type of diet the horse is on – that can have an effect on behaviour. I also ask about the worming programme and any health problems. If you think it is the horse for you it is worth asking your vet to check it out. People so often buy the wrong horse, so never be afraid to look at one that is older and more experienced. We have the expertise here at the centre to break in and bring on a youngster, but some owners end up with problems that they simply can’t deal with. Active pensioners can lead full and fun-filled lives and can prove to be the perfect best friend. Our lovely Thomas and Megan, who have recently retired, have both gone to great homes where they will be kept busy. The important thing is to find the horse that is right for you.